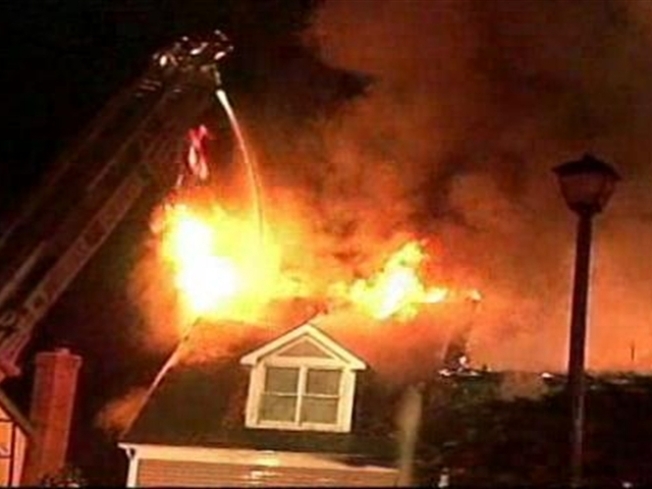 Six occupants of a home in Centreville, Va., had to run for their lives when their home erupted into fire. Fireworks that weren't properly discarded sparked the blaze, officials said. It started about 11pm at 5205 Ellicott Court. When firefighters arrived at 5205 Ellicott Court at about 11 p.m., they found heavy fire in the front of the home and through the roof. They had it under control within 40 minutes but the home is a total loss. Fairfax County fire officials said improperly disposed fireworks sparked a massive blaze, destroying a Centreville home. Investigators said it was accidental, started by legal fireworks on the front porch. Four adults and two children escaped uninjured.